Having proven it works, what’s next then for the discipline? Beyond speed, or volume, sourcing organisations will be differentiated by agility, or as defined by analyst Andrew Bartolini of Ardent Partners, sourcing quality. Are we using e-sourcing technology to improve all aspects of our sourcing process? What kind of spend intelligence are we capturing and how well are we applying it to sourcing decisions? How far way are we from a fully integrated source-to-settle process? What’s our talent profile today? What do we need for tomorrow? How collaborative are supplier relationships? How fragmented is our approach to sourcing? 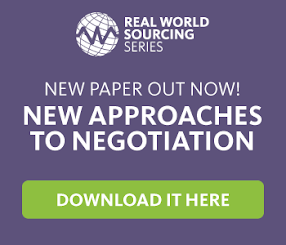 What can we do to apply strategic sourcing to more aspects of our business? Check out the report The State of Strategic Sourcing 2013 to learn more about how sourcing agility translates into sourcing excellence and how you can leverage what some of the best and brightest are doing to make agility-based sourcing work in their organisations.